U.S.-Bolivia Ties Strained As Coca Production Rises The two countries have been sharply at odds over coca, which Bolivian President Evo Morales says is unfairly demonized by the United States. Some Bolivians say the spread of coca is troubling, but farmers say they just can't make it without planting the crop, now that the price is increasing. Coca plantations dot the fertile, green mountains in the Yungas region of western Bolivia. Women pick up dried coca leaves in Villa Remedios, in the Yungas region of Bolivia, in October. 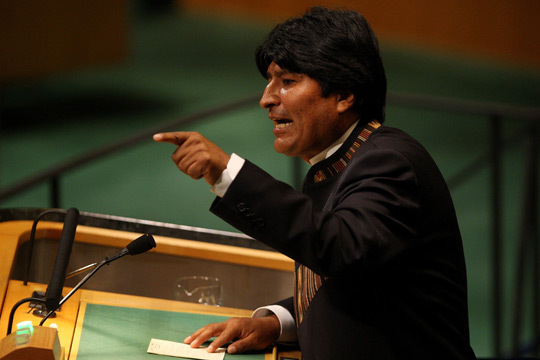 Evo Morales' career and his political rise have been closely entwined with the growing of coca. Read a profile of Morales. 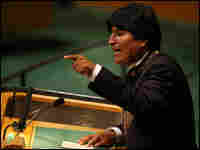 Bolivian President Evo Morales, shown addressing the General Assembly at the United Nations in September 2007, says the U.S. unfairly demonizes coca. Leftist President Evo Morales ordered the American ambassador to leave Bolivia last week, accusing him of fomenting unrest. The United States denied the charge, but responded by kicking out Bolivia's ambassador. The current rift comes amid an ongoing dispute between the two countries over coca, which Morales says Washington unfairly demonizes. 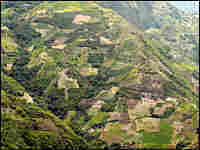 Morales has permitted coca farmers to cultivate small plots. The result has been a sharp increase in coca production — and what the U.S. says is a big rise in drug trafficking. Guido Toro's weathered but nimble fingers go to work, shucking the small, green leaves off a coca bush. His view is majestic — fertile, green mountains in the Yungas region of western Bolivia. He explains that you have to take care not to rip off the seeds. Such attention to detail has helped him cultivate the biggest, most productive coca fields around. Coca has long been legal in Yungas — nearly 30,000 acres are set aside for farmers. What they produce is supposed to go for chewing or tea, or even crackers and toothpaste. But Toro and others acknowledge farming far more than 30,000 acres. It's an economic decision: Coca generates much more money than oranges or coffee. "Coca is the only thing saving Yungas right now," Toro says. The cocaine trade is alive and well, fueled by increasing drug use in Europe and Brazil, and huge, steady consumption in the United States. Bolivia does eradicate coca, but its farmers also help satisfy demand. 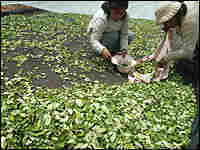 A recent United Nations study of coca in the Andes shows Bolivia's production is up 5 percent over 2006. The total is less than in Colombia or Peru, but the growth in Bolivian coca has been constant. It translates into the clear-cutting of forests. Vicky Ossio owns the Green Trail eco-lodge, a reserve shared by monkeys, macaws, turtles and scores of other animals. She is close to the coca growers but says coca's spread is troubling. "Although this is a legal area for coca production, a good part of it is going for illegal purposes," she says. "Everybody knows that." The government has a vice ministry for coca, but officials there did not respond to requests for comment. Coca has a storied history in Bolivia, where it has been cultivated for centuries and chewed like tobacco. The leaf wards off hunger and increases stamina. In the 1980s, Bolivia was a virtual narco-state, and one of its leaders became a pariah as cocaine production dominated. A harsh anti-drug campaign, funded by the United States, nearly wiped out the crop. A former coca farmer, a union leader and a staunch nationalist, he vowed to curtail Washington's war on drugs in Bolivia. Recently, he told reporters in the capital, La Paz, that his adversaries constantly accuse him of ties to drug trafficking. "It's permanent, these types of accusations," he said. "Every night, every day around here — lies, accusations." He also says many Bolivian farmers are churning out legal crops. 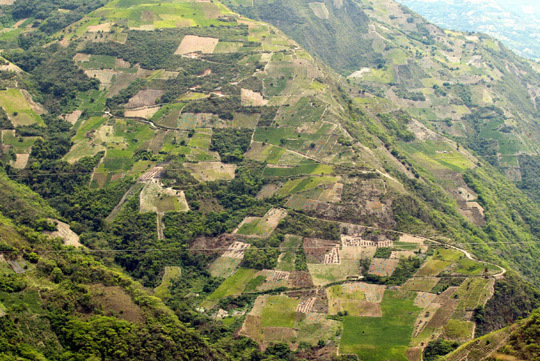 In Yungas, farmers have long taken advantage of good soil and a temperate climate. On the Montano family farm, a machine peels shells off freshly picked coffee. A few feet away, Abraham Montano tastes — and spits out — coffee. His job is to make sure the farm is producing top-grade beans. He's one of 10 siblings who are each responsible for a facet of coffee production. The family agronomist, Lidia Montano, says that helps them stay in business while other farmers around them turn to coca. "We clash with the community because they dedicate themselves to planting coca," she says. "We do not accept that." But many of the farmers in the region say they just can't make it without planting coca — and now the price is increasing. Avocados and citrus trees grow at Toro's farm. But Toro is planning to increase coca production. "I changed from coffee to coca because we saw it was more advantageous for us," he says. 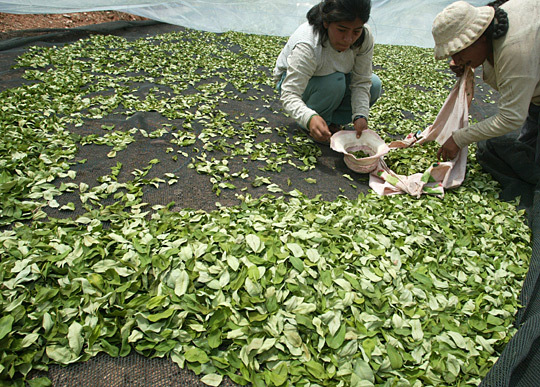 Toro pulls out a huge tarp where coca leaves are dried. Then, he walks into a storeroom where he keeps coca in massive bags until the price for the leaf is higher, when he sells. The coca ends up in the huge — and legal — coca market in La Paz. The market is full of people — indigenous women in bowler hats and big layer-cake skirts, men in work clothes — all listening to music as they bag and weigh leaves. Adelio Soria, who is among the leaders of a local coca farmers' cooperative, says Bolivian coca has dignity and that those who say coca goes into cocaine are trying to slander farmers. There are, of course, plenty of legal buyers — like the folks at El Viejo Roble, a liquor maker that produces a sweet coca liqueur. Marketing manager Miguel Cardenas says he hopes to one day export the liqueur. "One coca leaf industrialized is one less coca leaf for narco-trafficking," he says. American counterdrug officials, though, say that increasing amounts of the coca wind up in clandestine labs dotting the region — labs where leaves are processed. The finished product — cocaine — then heads west or south, toward Brazil and Argentina. A young man named Miguel — who didn't want his full name used — says traffickers paid $500 to turn his family kitchen into a makeshift lab. He says the traffickers go from home to home, paying for temporary quarters for their labs. That's the only way to keep from getting caught.